Cognitive RPA is becoming one of the fastest moving technologies that is helping the enterprises to automate their complex repetitive tasks done by humans which takes lot of time and efforts. RPA technology vendors are integrating cognitive capabilities within RPA platforms for making it more advanced and intelligent. Global cognitive robotic process automation market is rapidly growing due to increasing adoption of digital workforce across different industries. Cognitive technologies integrated within robotic process automation helps to automate complex repetitive tasks by enabling decision making capabilities. This helps to carry out activities such as data entry and reconciliations. Cognitive automation requires human assistance only in cases where it encounters some of the unknown problems and queries. Cognitive robotic process automation learns from the human operator in order to improve its automation capabilities for the next time if it encounters the same problem. is considered to be the key drivers for its increased adoption across multiple industries. Moreover, developments in the cognitive technologies as well as the increasing demand of automation from financial sector is providing an opportunity for the growth of the global cognitive robotic process automation market. There are mainly two types of cognitive robotic process automation market that includes services and platforms. In addition to this, the market of cognitive robotic process automation platform is expected to have the highest growth rate during the forecast period 2017-2026 due to the high demand across Asia-Pacific region. By analysis, global cognitive robotic process automation market is estimated to generate a revenue of $50.0 million in 2017 and is forecast to grow at a CAGR of 60.9% during 2017-2026. North America is expected to acquire most of the revenue in the global cognitive robotic process automation market in 2017 with the U.S. acquiring most of the market share, globally. However, Asia-Pacific is expected to have the highest growth rate during the forecast period 2017-2026. 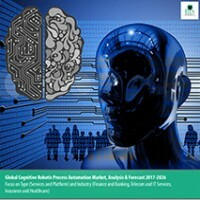 • The study provides detailed analysis of the 15 key players in the cognitive robotic process automation market including Blue Prism, Automation Anywhere, IPsoft, NICE Systems Ltd., UiPath, Verint System Inc., WorkFusion, Pegasystems Inc., Kryon Systems, Kofax, Thoughtonomy Ltd., Redwood Software Inc., Arago and Celaton Ltd., among others, in the Company Profiles section. This section covers business financials, company snapshots, key products & services, major developments, future programs (if any), and finally, the individual SWOT analysis. The technological shift towards the use of Robotic Process Automation (RPA) which helps to automate multiple tasks carried out by humans is changing the traditional ways to process business operations. There has been an increasing trend of digitizing labors through the use of mobile technology, big data and cloud computing, among others. Software bots are able to eliminate inefficiency and automate the routine tasks that consume a lot of time. There are number of companies that are already using robotic process automation for carrying out their business operations in order to reduce time and cost. The significant growth in the robotic process automation technology is increasing the trend of process automation in various applications across multiple industries including finance and banking, telecom and IT services, insurance and healthcare, among others. There has been emergence of technologies including artificial intelligence, natural language processing, machine learning and voice recognition, among others. These technologies are being significantly used in cooperation with robotic process automation in order to make them advanced and enable intelligent automation. The integration of cognitive capabilities within robotic process automation leads to the development of cognitive robotic process automation. Cognitive RPA is an intelligent automation software tool which is able to automate multiple repetitive tasks that requires human interference and judgment. Cognitive robotic process automation augments the human worker while handing multiple business process. The cognitive robotic process automation bots escalate the unknown issues to the human operator. After escalation, the software bot learns from the experience and enhance its knowledge over time to handle problems on its own. Moreover, the rapidly increasing robotic process automation technology provides opportunities for the growth of cognitive technology enabled RPA software and solutions. There are various companies that are integrating cognitive technologies within robotic process automation software for enhancing their area of operations. The robotic process automation is able to automate perceptual and judgment-based tasks through the integration of multiple cognitive capabilities such as natural language processing, machine learning and speech recognition with in RPA. The global cognitive robotic process automation market is expected to reach $3,620.8 million by 2026. Owing to the growing demand for digital workforce in order to increase efficiency and reduce operating cost in business processes, the global cognitive robotic process automation market is expected to grow rapidly at the CAGR of 60.9% during 2017-2026. The global cognitive robotic process automation market majorly focuses on the types that includes services and platforms. The cognitive robotic process automation services is expected to acquire the highest market value in 2017 and is forecast to grow at a CAGR of 57.0%. The reason for such strong market share is attributed to its high cost of the services as compared with the platforms. Moreover, the market of cognitive robotic process automation platform is estimated to grow with the highest CAGR of 69.6% during 2017-2026 due to advancements in the cognitive technologies. The cognitive robotic process automation technology is estimated to be utilized across various industries including finance and banking, insurance, healthcare, telecom and IT services and others. In 2017, the highest share of the global cognitive robotic process automation market is estimated to be acquired by finance and banking followed by telecom and IT services, insurance, healthcare and others. Finance and banking industry is expected to acquire ~39.8% of the global cognitive robotic process automation market, in 2017. However, insurance industry is expected to grow with the highest CAGR of 64.0% during 2017-2026. North America is expected to dominate the global cognitive robotic process automation market in 2017 and is forecast to grow at a CAGR of 59.3% during the forecast period 2017-2026. However, Asia-Pacific is expected to grow at the highest CAGR of 63.1% during 2017-2026. Arago, Automation Anywhere, Blue Prism, IPsoft, Kofax, Kryon systems, NICE Systems, Pegasystems Inc., Redwood Software, Thoughtonomy Ltd., UiPath, Verint systems Inc. and WorkFusion, among others are some of the major players of the global cognitive robotic process automation market. The U.S. is the most prominent nation in North America for the growth of the global cognitive robotic process automation market. The increased demand for cognitive robotic process automation in the U.S. is due to growing finance and banking as well as telecom and IT services industries. Europe is another leading region for using cognitive robotic process automation. Some of the prominent countries in the European region include the U.K., Germany, France and Denmark, among others. The Asia-Pacific region is expected to grow at the highest CAGR during the forecast period 2017-2026. Some of the prominent nations in Asia-Pacific region includes Australia, Singapore, Japan and India, among others. The rising demand is caused by emerging economies across Asia-Pacific region. Furthermore, rest of the countries in Asia-Pacific region is expected to show the highest growth rate in the global cognitive robotic process automation market. The Asia-Pacific region could provide a lot more opportunities to the new entrants in the market. The rest of the world includes Middle-East, Africa and Latin America; the region is estimated to have a rapid growth rate for cognitive robotic process automation market during the forecast period 2017-2026.